Documentaries that revolve around a particular competition can be informative, enlightening and amusing. Beyond the exploration of a given subculture, following a group of competitors as they immerse themselves in their training and subsequent challenges becomes a fascinating social and psychological study that showcases the personalities of people we'd normally not be interested in. Much like other recent competition-based docs, such as Spellbound or Ecstasy of Order: The Tetris Masters, Hugh Hartford's Ping Pong takes an interesting look at the World Table Tennis Championship in China, shedding some light on a quirky group of people that have devoted their lives to the sport of ping pong. What sets Hartford's film apart from other docs is that he focuses on a group of senior citizen competitors, ranging in age from 80 to 100 years old. The film's format is simple, following eight players as they prepare for and then attend the championships, yet it is the backstories surrounding the contestants that make for an incredibly engaging viewing experience. Among the seniors featured are Les (89) and Terry (81), from the UK; Inga (89) and Ursula (89), from Germany; Lisa (85), from the U.S.; Sun Yong Qing (80), from Inner Mongolia; Rune (85), from Sweden; and Dorothy (100), from Australia. Even though all of them are well past the usual age of a typical sporting competitor, they've found table tennis beneficial late in life, gravitating to the sport for various reasons. 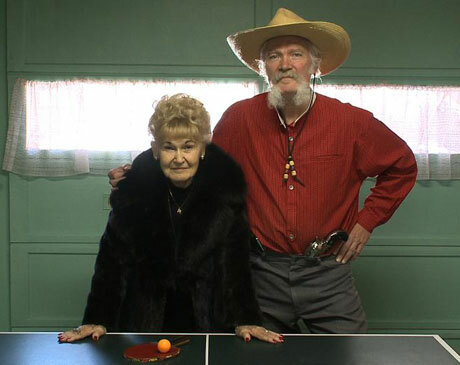 Ursula uses ping pong as a way to combat her dementia, while Terry, who has been battling cancer for 15 years, uses it as a focus, allowing him to push forward and combat his ailment. Hartford takes a bit of a backseat in his direction, which allows the contestants and their various family members to drive the narrative. The film's subjects are wise beyond compare, with life stories that have much to offer viewers of younger generations. And while the focal point is the sport itself, Ping Pong quickly becomes a story of inspiration.